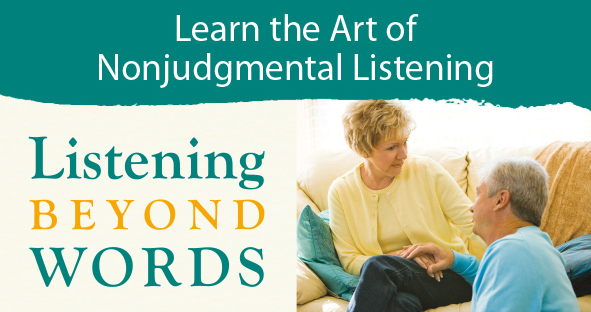 What is “Listening Beyond Words”? Listening Beyond Words is a community-based learning opportunity program offered by The Samaritans of Rhode Island. As a long-time trusted charitable organization, we are in a unique position to increase awareness of the importance of nonjudgmental listening at home, at work and in our community. Every day, we at The Samaritans know there are missed opportunities to connect, in a meaningful way, with our loved ones, our family and neighbors, friends, co-workers, clients, customers and constituents. At home and in our personal relationships, those missed opportunities often lead to hurt feelings, misunderstandings and isolation. At work, not listening leads to unsure expectations, poor client relations, unhappy employees, frustrated managers and less than desired business outcomes. In the community, missed opportunities often lead unnecessarily to distrust and conflict. How does listening become an art? Like anything else in life, to do something well takes a lot of self discipline and a lot of practice. With practice, the outcome of active listening may be the identification of problems that can lead to creative solutions. Anyone, if they really care and really try, can learn the art of nonjudgmental active listening. How would you best describe the training? The class is just 1.5 hours long. 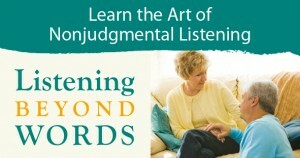 It’s a thought-provoking introduction to the art of befriending and active, nonjudgmental listening. Our goals are twofold: (1) to persuade you to think differently about what you hear people say to you and to each other, and (2) to persuade you to think differently about how you react to what you hear. This class is NOT about suicide prevention or preparation for answering our Crisis Hotline/Listening Line. Suicide prevention is a complex combination of medical, behavioral and access-to-care issues. That being said, the World Health Organization and the U.S. Surgeon General note one of the biggest risk factors for suicide is the lack of connectedness in the world today. We’d like to believe the more people become better listeners and demonstrate they truly care, the more likely family, friends, clients and patients, co-workers and employees who need help will feel comfortable speaking to someone they trust and getting the assistance they may need. Who will teach the session? The class will be taught by staff and senior volunteers who, through their combined experience, have spent hundreds of hours on our Crisis Hotline/Listening Line and teaching the art of befriending and nonjudgmental listening to our agency volunteers. How many people will be in the session? Our space can accommodate up to 20 people per session. The session will be held at The Samaritans’ Forget-Me-Not Gallery and Community Education Center in Pawtucket. Spring 2018 dates will be posted soon. Corporate groups welcomed to contact us. Just as with our Crisis Hotline/Listening Line requirement, all participants must be 18 years of age and out of high school. The cost is $35 per person and includes program materials. Must I register and pay before attending? Yes. Because space is limited, advanced registration and payment are required. You can register by calling our business line at 401.721.5220. We accept credit cards. Registration and payment can also be made through our Paypal account on our website at www.samaritansri.org. Just write the date of the class, your email and telephone number in the memo line. We will also accept checks in advance of the class. Please make checks payable to The Samaritans of Rhode Island. Can I get a refund if I don’t attend? We will try to reasonably accommodate you if there is a need to change the date to another session, but any cancelations not rescheduled will be considered a donation to The Samaritans and will support our agency programs. Please note: Classes may be canceled and rescheduled due to inclement weather or other circumstances beyond our control. Reasonable efforts will be made to reach you. Please call our business line (401.721.5220) to learn whether classes are canceled. Can I register my employees for the class? Yes, we welcome business and corporate participation. Please call to make arrangements.